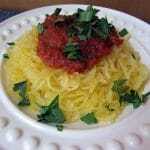 Make amazing, low carb spaghetti sauce for spaghetti squash, meatballs, zoodles, and more with this easy recipe. Sometimes reading ingredient labels can be a real bummer. Take spaghetti sauce, for example. Prego has 9 grams of sugar in each serving, and Ragu has 8 grams of sugar! If you’re eating low-carb or want to reduce your sugar intake, that can be a real surprise. 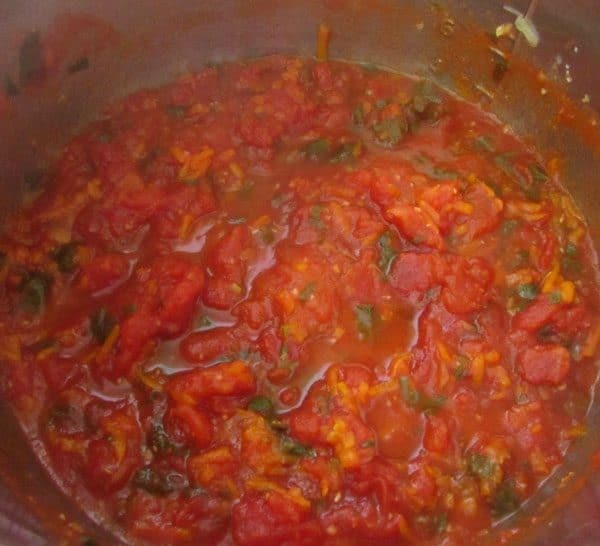 Hubby is eating low-carb, so I wanted to make a healthier spaghetti sauce for him without added sugar. We use lots of spaghetti sauce, and not just for pasta. It’s a great dipping sauce for zucchini fritters, we top our meatball sandwiches with spaghetti sauce, and lots more. 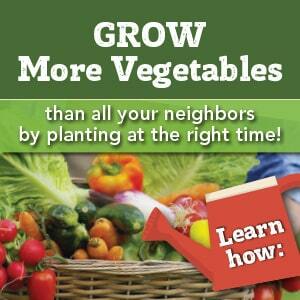 If you’ve ever eaten a ripe tomato from the garden, you know how sweet and tasty they are. So how could I capture that sweet flavor in spaghetti sauce without adding sugar? There’s a secret ingredient that will blow your mind. 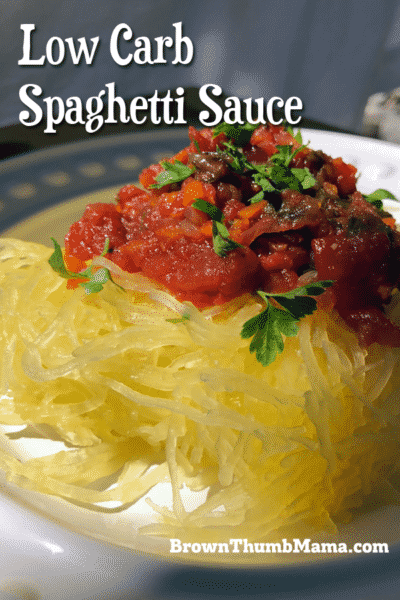 When it’s ready, you can leave it chunky and have low carb marinara sauce, or you can blend it a bit to make a more traditional spaghetti sauce texture. 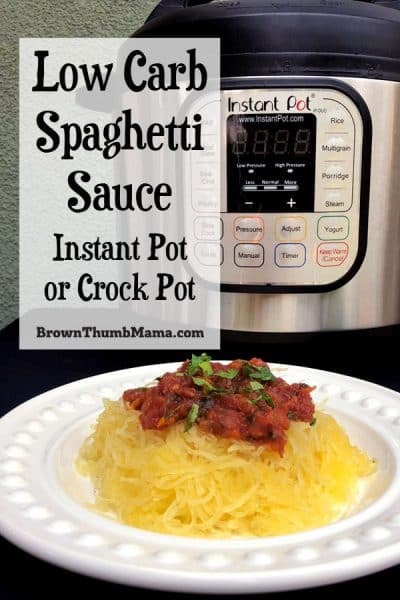 I like it smooth, served atop a mound of spaghetti squash cooked in the Instant Pot. Instant Pot: this is the safest and simplest pressure cooker I’ve ever used. Crock Pot: if you prefer to use a slow cooker. Susi garlic press: The Frugal Gourmet recommended this on his show when I was a teenager and I’ve used mine ever since. It’s a workhorse! Kitchen Aid food processor: to shred the onion and carrots. Immersion blender: if you want to puree the sauce so it’s less chunky. Put the olive oil in the Instant Pot and set it to Saute. Once the Instant Pot is hot, add the garlic, onion, and salt. Saute them for 3-5 minutes until the onions soften and start to become translucent. Don’t let them become brown--you just want to soften them to release their flavors. Push Cancel to stop the saute while you add the next ingredients. Add the carrots, tomatoes (juice and all), parsley, and basil. Stir gently to combine. Put the lid on the Instant Pot and set the valve to Seal. Select Manual and cook on Hi pressure for 22 minutes. Allow pressure to release naturally and open the lid carefully. Blend carefully with the immersion blender if you prefer a smooth texture, or leave chunky for use as marinara sauce. Serve over spaghetti squash or zoodles for a complete and nutritious low-carb meal. Put all ingredients in the slow cooker and stir to combine. Put the lid on the slow cooker. Set to Low and cook for 8 hours, or set to Hi and cook for 5 hours. Stir occasionally. 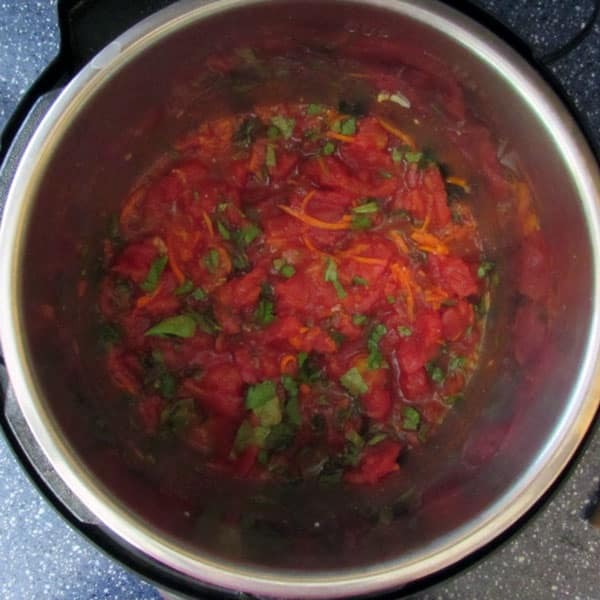 What will you serve your Low-Carb Spaghetti Sauce with? Help me out with more ideas!